We in the Solidarity Movement for a New Ethiopia (SMNE) are deeply grieved at the murder of Samuel Aweke Alem,Obang Metho, Executive Director SMNE a charismatic and highly popular lawyer who recently ran as a Blue Party (Semayawi Party) candidate for parliament in the May 24, 2015 Ethiopian National Election—an election where the ruling and ethnic apartheid party has claimed all the votes so far. The prevalent belief is that he won; but, it is a victory that would never be tolerated or acknowledged by this ethnic apartheid regime of the TPLF/EPRDF. Now, his refusal to give up the struggle for freedom and justice was also seen as a threat. “Any price I am going to pay is for my country and for freedom. I may be imprisoned, but my conscience will still be free. If they murder me I am passing this torch of struggle. Especially I am appealing to you – my contemporaries of this generation”. According to information we received today May 16, from members of his family and the Blue Party, Samuel Aweke Alem, age 29, was born in Eastern Gojjam in a small village called Gende Weyin. He pursued a degree in law and was licensed in 2010, after which he worked for several different agencies as a private lawyer. He joined Coalition for Unity and Democracy (CUD) or Kinijit and then Unity for Democracy and Justice (UDJ) or Andinet before joining the Blue Party or Semayawi three years ago. He is described as being loved and respected by many in the area. He was proactive in initiating the community’s involvement in political affairs, including being a whistleblower in regards to exposing many of the administrative abuses in the area. He also was a columnist for Negere Ethiopia, an online journal. 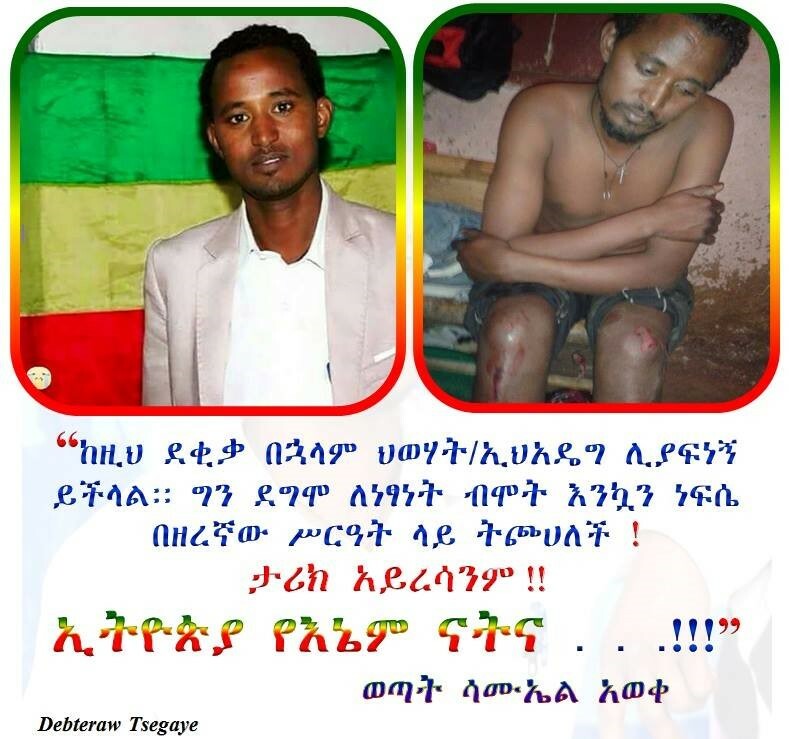 During the time leading up to the election, he was injured after being beaten by five regime cadres as well as being the victim of other abuse, intimidation and harassment by the TPLF/EPRDF cadres. Reportedly, he decided to become involved in politics at the age of 25, believing he could have greater impact in working to make Ethiopia a better place. Even though he knew what politics were like in Ethiopia, it did not deter him. Furthermore, because he knew what he stood for and pursued it, he became an influential leader. As a result, despite the fact that he was rational, mature and law-abiding in his conduct, he was seen as a real threat to the ethnic apartheid regime because of his popularity and courage. This did not end with the election. After the regime cadres again attempted to silence him, he recorded the details in the same Facebook posting. “The unashamed EPRDF who lost the voters confidence, kidnapped and beat me on May 29, 2015. And now, unsatisfied that I am still alive, they are in the process [of] throwing me to jail overriding my rights of immunity by creating false witnesses against me. The security forces are harassing and threatening me, calling my phones repeatedly. I may be murdered, imprisoned, kidnapped but freedom is a surety. However, I am recording for the sake of history and passing the record as well of those security persons’ name, pictures, and address as well as the ring leaders of those who are organized to make false witnesses and those who are going to witness against me; the 04 Kebele officials of Debre Markos city and also the police”. Background: In 2014, Ato Samuel announced his candidacy (Blue Party) for the Ethiopian House of Parliament for his home city, Debre Markos. Following that announcement, the police began to harass and intimidate him in an effort to force him to drop out of the race. At some point he no longer was willing to tolerate this illegal obstruction of the electoral process and reported it to police station officials. As he told them about the harassment and that it was wrong, the police informed him that he was breaking the law and that he should not run for office. He objected, telling them he was a lawyer and knew the law. They continued to attempt to intimidate him, but he did not back down. Finally they told him to go to the Justice Department because they were the authorities responsible for their position. Ato Samuel did exactly that. At the District Justice Department, he reported the harassment, intimidation and pressure to not participate in the election, again saying it was wrong. The way they responded was so insulting and offensive that when he later wrote about it in a column on Negere Ethiopia, he refused to give the exact statements used to demean him as they were too disgusting to be used in civil discourse. However, in that same article he gives an account of how police and Justice Department officials harassed him. Reportedly, they threatened to take away his law license, telling him he would no longer have a means to earn an income and he would end up struggling to survive. They told him he should basically shut up and accept all they do without questioning or leave the country. If he continued, he would be put in jail or killed. Ato Samuel told them he believed that what he was doing was right and assured them he would never back down from what he believed in, no matter the cost. His testimony or article still can be read online. This is another example of the criminal hijacking of the Ethiopian Constitution that has led to the obstruction of the electoral process, enforced by police, security agents, and regime cadres, and backed up with impunity by the Justice Department. This is the brutal and corrupt ethnic apartheid regime that claims a 100% election victory and which has been portrayed too often by donor countries as a model for economic progress. That economic progress should be held as much suspect as the results of this fake election. The assassination of Ato Samuel by regime cadres will attest to that. Even though Redwan Hussein, a regime communications official, reports that they have caught a suspect and that the attack stemmed from a legal dispute, why should anyone believe it when all information points to regime cadres as the perpetrators? In the meantime, many grieve this loss. SMNE Executive Director, Obang Metho, states: “Along with countless Ethiopians, we in the SMNE deeply grieve the loss of this heroic young man. He already had measured the costs and knew the risks he was taking. We send our heart-felt condolences to his family members—his mother, father, brothers, sisters, and other relatives—as well as to his friends and colleagues. The way you raised your son helped prepare and equip him with the moral courage to stand up for what he believed; even in his death it is a testimony to others. He stood up for something greater than settling for the status quo as he strived for a more moral, free and just society. With this murderous regime’s efforts to close down all political space, many of those with the strongest voices for freedom are dead, locked up in jail, or seeking asylum in foreign countries. The rays of light they brought to the nation are extinguished, leaving Ethiopia in increasing darkness. The remaining few people shedding light have become targets of those who thrive in the dark. One strong ray of hope from the North Star in the Amhara region has now been burned out. Now we just received word of another tragic murder of an opposition member from the Tigray Region. Ato Tadesse Abraha, age 48, was a member of the Arena Tigrai party, from Tigray region, which is part of the main opposition coalition Medrek. Ato Tadesse was a candidate for parliamentary seat in May 24, 2015 election, in the Kafta-Humera District or Wereda in Western Tigray Zone. The same as Ato Samuel, he was also assassinated on Tuesday June 17, 2015 by the regime cadres, according to the party spokesperson Amdom Gebreslasie. Ato Tadesse was a harsh critic of the ethnic-apartheid policies of the TPLF/EPRDF. He regularly called on the majority of Tigrayans to speak out and reject the TPLF policies, saying: “Not in our [Tigray] name!” He greatly feared that the immoral and selfish policies of favoring one ethnicity over all others would backfire and eventually could threaten the innocent Tigrayans along with the engineers of the architecture of these unjust policies. Ato Tadesse was killed for these beliefs, but was much loved and highly respected by his community. The chairman of his party, Arena, Ato Berhanu Berhe stated that: “Tadesse was a great man, one of a kind, and that it was a huge loss for them, but that our struggle for justice and freedom will not end by killing our people or terrorizing us” Ato Tadesse was murdered because of his unrelenting moral courage and strength. Now, another light of hope and truth from the Tigray region has now been snuffed out. His loss is not only felt by his family and his party, but is felt by the whole nation, most of who are yearning for a better Ethiopia for all. He was one of the voices of conscience speaking up against the politics of ethnic hatred and division. His strong condemnation of these TPLF ethnic policies was especially dangerous in a region where it was so firmly entrenched. He knew the risk and took it. Ato Obang Metho, who much-admired Ato Tadesse, as well as other members of the SMNE, sends their deepest sympathy to his family, loved ones, friends and colleagues: We feel your pain. The murder of this great man is not only a loss to you, but his death is a loss to the entire country. He could have become the bridge we needed to bring healing and reconciliation to this country that we all love. As millions of Ethiopians grieve with you, his shining example of standing up for what is right is already drawing people to cross ethnic, regional, religious, and political lines to stand together as Ethiopians wanting a free, just, and prosperous Ethiopia for all. May God use his strong example to inspire more people to respect and value the humanity of others, not only those from their own ethnic group. As we grieve for him like a sibling, it is another assurance that we are more one family than a tribe—the family of Ethiopia. On May 25, 2015, the Oromo Federalist Congress (OFC), which is part of the main opposition coalition Medrek, reported that two of its officers, namely Ato Gudisa Chemeda and Ato Teshale were killed in Chelia district of the Oromia region. The assassination of Ato Samuel and Ato Tadesse put the post- Ethiopian nation election killing count at four. Like in the case of these four extraordinary men, many other rays of light and hope have been extinguished in other regions of our beautiful country, like in the Afar, Gambella, Benishangul, the Ogaden and in the Southern Nations. It has left the entire country of Ethiopia in darkness, holding back all our people from moving forward together as one. May God touch the hearts of the more rational individuals from the TPLF/EPRDF—those who are holding up this regime—so they realize that the path they are on will lead to mutual destruction. May they realize the only way out of this looming crisis is to demand an Ethiopia for all the people. May God empower us to use this tragedy in His way so that radiant and life-giving light returns to Ethiopia and restores our land and people. This Press Release has been CC to: all the USA foreign policy makers, UK, EU other donor countries, international organizations and major news media outlets such as BBC, the Guardian, New York Times.